LOWELL, Mass. -- Senior forward Ryan Dmowski (East Lyme, Conn.) scored two goals in the come from behind tie to pace the No. 19 ranked UMass Lowell Hockey team on Saturday night against Boston College in front of 5,042 fans at the Tsongas Center in Hockey East play. The River Hawks moved their unbeaten streak to 6-0-1 with the tie and now own a 14-8-2 overall mark (8-4-2 HEA). Boston College moves to 8-12-3 overall and 8-4-3 in league play. "It was a good hockey game, obviously there was a lot of excitement," said UMass Lowell Head Coach Norm Bazin. "We didn't come out to start the way we wanted, however the second period was better and I thought the third was excellent." Dmowski tied the game with two minutes left in regulation for his team-leading 10th tally of the year to cap the River Hawks three-goal effort in the third stanza to pull out the point. 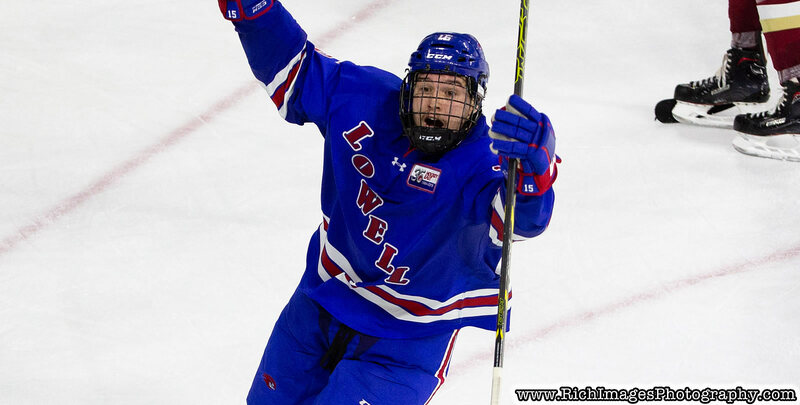 Dmowski has recorded six goals in his last five games for UMass Lowell. He scored 1:15 into the third frame for his first of the night to cut BC's lead to 3-2 and then freshman defenseman Chase Blackmun (Hudson, Wis.) knotted the game at 3-3 with his second career marker. Dmowski finished the night with a game-high six shots on goal for the River Hawks. JD Dudek gave the Eagles the 4-3 lead with 5:11 to play in the third period. The Eagles opened the game with a 3-1 lead in the first 25 minutes of the game on goals by Oliver Wahlstrom, David Cotton and Christopher Brown. UMass Lowell's Kenny Hausinger (Anchorage, Alaska) scored the lone goal in the first period for the River Hawks for his eight tally of the year. Senior goalie Christoffer Hernberg (Espoo, Finland) stopped 22 shots in the tie, while BC's Joe Woll stopped 33 shots by the home team. UMass Lowell outshot the Eagles, 15-5 in the second period. The River Hawks return to action on Friday, February 1st at Northeastern. Game time from Matthews Arena in Boston, Mass. is 7 p.m.